With the airline prices being what they are (seriously, how am I supposed to fly four people round-trip from Germany to Michigan regularly with prices like this? ), we decided to stay closer to home during this summer vacation. This is our house. No, wait. It's the Veitshoechheim palace from the side. We went camping about an hour away from home. One of our day trips was a boat ride down the Main River from Wurzburg to Veitshoechheim. 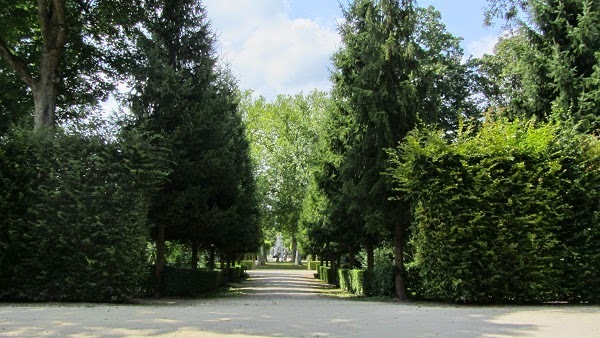 We spent a few relaxing hours in the palace garden there. The palace was built from 1680-82, but renovated in the mid-1700s. Click here if you want to see what it looks like inside. 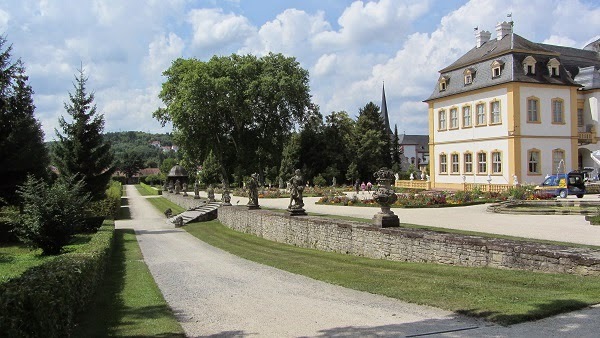 The garden is one of the few French Rokoko-style palace gardens in Germany. I think of it as an example of what someone builds who has a lot of money and doesn't know what to do with it. 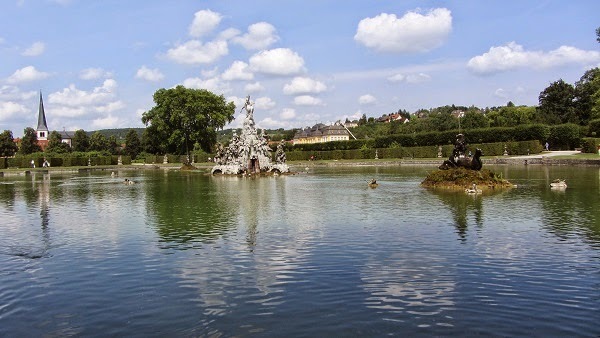 Besides trees and flowers, there are around 300 sandstone sculptures, several fountains and even romantic-looking, if artifical, ruins. 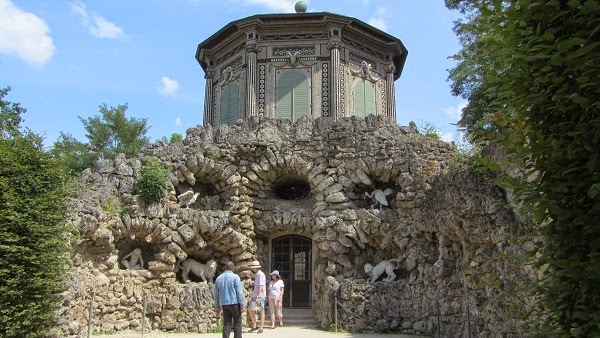 In the rear corner of the garden lies the Grotto. Looking at it today, I see a monstrosity of kitsch. But back in the 1700s, it must have been a fantastic place. Kind of the sci-fi/fantasy building of the time. In the summertime, it must have been the place to cool off and daydream. 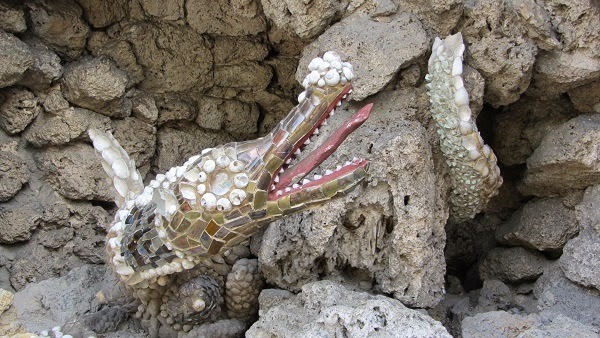 The Grotto is covered with rocks, semi-precious stones and shells, both inside and out. 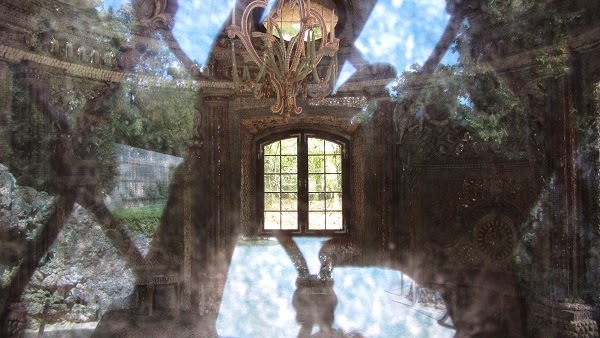 Inside the Grotto. It was locked, and an iron grate prevented me from getting closer to the glass window. There aren't many lakes in the area of Germany where I live, so my favorite part of the garden are the ponds. 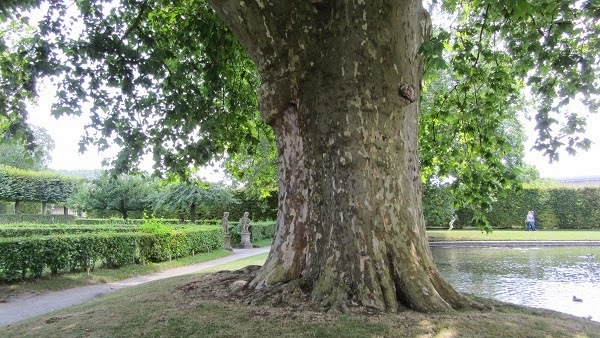 This one has a huge sycamore tree at each corner. My husband, my two kids and I held hands and just managed to reach all the way around this trunk. We also had fun at this larger pond, which is stocked with catfish. As we walked along the shore, they followed us, hoping for a few bread crumbs. They were so tame, my son almost managed to pet one. Large pond with fountains. The palace is in the background. We also spent a day in Ochsenfurt, and I hope to add a couple pictures from that town in the next few days.